Good morning! This week our challenge is a Color Combo Challenge. 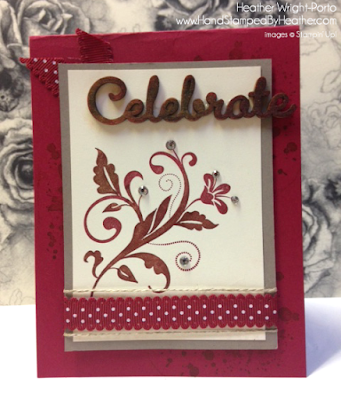 We can use any stamp set or card layout, but want to stick to this color scheme. So, I create this card using the Flowering Flourishes stamp set. You can use it for every day Birthday, or since these are Holiday colors, you can use this as a Holiday card with the word "Celebrate" from the Natural Elements collection. Here, I'm trying to show you the word "Celebrate" is actually inked with Cherry Cobbler on the edges and colored with Old Olive marker. To try and give a sponges, multi-color look. In this image, I'm showing off the Rhinestones and the bling in the card, which is hard to show in ther vertical pictures. Also, notice the stamped image....it is stamped in Cherry Cobbler, then I used the Old Olive marker and colored on the stamp before stamping down. Notice the multi-color. 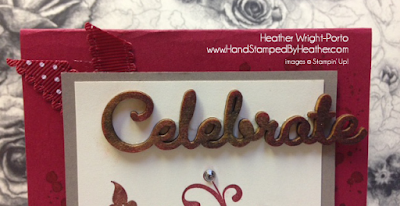 I like using Stampin' Markers to add multiple colors to a stamp. This one's just a little muted with the dark, vintage color scheme. Now it's time to go and see what the rest of the Happy Stampers Designers have come up with for this week's color challenge. 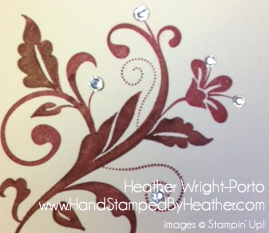 Thinking about joining Stampin UP? Sign up under any of these amazing ladies and become part of our team. Stunning card Heather, I love that stamp set and the Bling you added to the image is absolutely perfect. Very pretty Heather! Love the way that your image turned out. Great card! 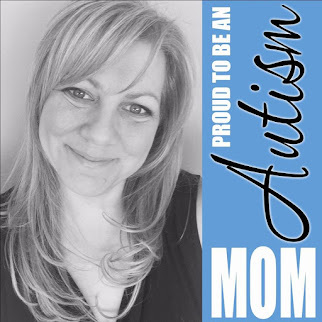 Love your card, Heather! You used one of my favorite techniques! Great result! Pretty, Heather. I like the colored Celebrate wooden element, too! Lovely card Heather. The Celebrate is just perfect with that stamp set. Such a great job...love the dual action on the colors. You are very creative. Well done.